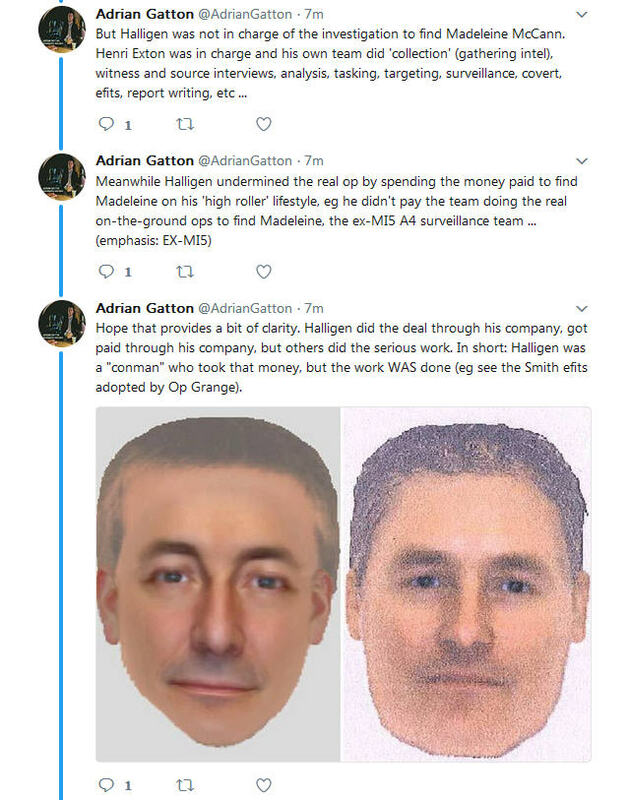 On top of the complete mystery of the disappearance of Madeleine McCann, we now have - at least we do at the moment - a second complete mystery: the death of a man at the very centre of the investigations into her disappearance - Kevin Halligen. Surrey Police told the Daily Mail on Saturday (13 January): “We were called to an address in Cobbett Hill Road, Normandy, Guildford, on Monday following a report of a man in his 50s having been taken unwell, who subsequently died. The death is being treated as unexplained and a file will be passed to the coroner's office in due course”. A quantity of blood was found at his home. It is always instructive to look at the very first news report regarding any event. This was clearly the report published around 3pm on Saturday by the MailOnLine website. The very first thing we notice is their banner headline: “EXCLUSIVE: Mystery surrounds the death of private detective Kevin Halligen, 56”. This tells us two things (1) that this story was supplied exclusively to the Daily Mail, and (b) that his death is a ‘mystery’. Which it still is. Whilst some newspapers are relatively casual about publishing stories from ‘sources’, the Daily Mail is not in that category. Moreover, the facts in their article are mildly sensational and quite graphic. They would hardly run this story without impeccable sources. NOTE: It is possible, the way the report is written, that the third source could also be the first source. C (from two sources) His death was ‘caused by alcohol’. Now we take a look at these sources. One of them is named: Tim Craig-Harvey. What do we know about him? He first came to the notice of people interested in the Madeleine McCann case when he appeared in a very strange film transmitted on Channel 5 in early 2014: ‘The McCanns and the Con-Man’. We also know that he was hired by the McCanns and Brian Kennedy as part of the Oakley International/Halligen private investigation which ran from April to August 2008. 4 That Henri Exton’s work with the Smith family in Ireland, including his puzzling two e-fits of two different-looking men, was a ‘breakthrough’ which had opened up the Met Police’s Operation Grange investigation into Madeleine’s disappearance and provided a new and valuable line of enquiry. In short, this Channel 5 ‘documentary’ was a fraudulent piece of propaganda. Moreover, as is clear from research threads on the CMOMM forum, all three had at one time been heavily involved with either the British government’s state security services, or the Ministry of Defence, or both. In Exton’s case, it has been publicly admitted that he was the former Head of Covert Intelligence at MI5. That means we have to take extreme caution in accepting anything they say about the death of Kevin Halligen. Why did these ‘sources’ speak to the Daily Mail? It is possible that someone within Surrey police contacted the Daily Mail first, alerting them to the suspicious circumstances about Halligen’s death - and that then the Daily Mail began contacting Halligen’s former colleagues and friends. We do not know. It is possible that Halligen’s friends felt they wanted, for whatever reason, to tell the Daily Mail that their friend had died and how he had died. It is certainly possible that they are not telling the whole truth about how he died. They do not appear to have said much except that one of them mentioned a lot of blood in the house, which has led to the rather lurid ‘blood-soaked body’ and ‘brutal murder’ headlines in some of the tabloids. It has to be said that there was no especial reason why the police or the Coroner or anyone else should make any announcement about Halligen’s death. Unexpected deaths happen all the time, the police pursue their enquiries, so does the Coroner. A conclusion is reached about the cause of death, and hardly anyone outside the family and friends know about it. In this case, three matters make his death of interest. First, Halligen was a prime and highly controversial private Madeleine McCann investigator. Second, the presence of blood. His girlfriend’s house was ‘covered in blood’, and the Daily Mail made reference to his ‘blood-soaked body’. And third, his previous history of being involved in the production of lithium batteries, Ministry of Defence contracts, and his many security services connections. Let us not forget, either, that Halligen was reputedly paid £2 million by corrupt Dutch company Trafigura, a company that for a long time was represented by top libel firm Carter-Ruck. 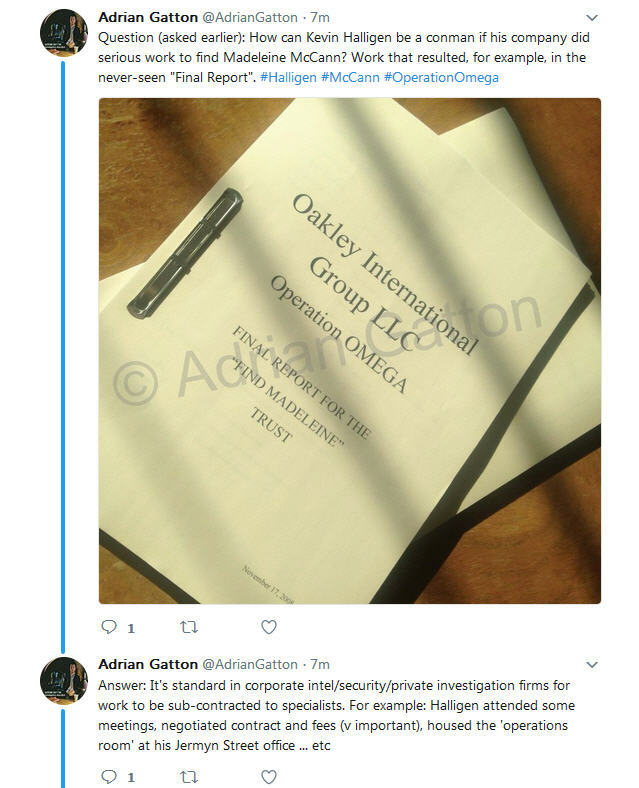 Is it a coincidence that the corrupt con-man and serial fraudster Kevin Halligen was employed by both Trafigura and the McCanns, both high-profile clients of the wealthy libel firm, Carter-Ruck? How is the blood explained? Tim Craig-Harvey: “The lies and alcohol finally caught up with him”. A Daily Mail source: “He died at his girlfriend's place…a miserable pathetic death caused by alcohol”. A ‘former colleague’: “The house was covered in blood but apparently that was from Kevin falling down so much”. An article by-lined by Tracey Kandohla said that “…a source who knew the Dublin-born debt-ridden private eye say he was ‘a boozer’ and ‘drink was inevitably his downfall’. The Sunday Independent yesterday quoted Adrain Gatton as follows: "Adrian Gatton, a TV director and investigative journalist, who made a documentary with Halligen in 2014 The McCanns and the Conman and who knew Halligen well, confirmed that he died last Monday, having sunk into alcohol addiction. He said: "Although his death is certainly not foul play, as has been suggested…My understanding is that he was found dead on Monday night. There was blood around the house, probably caused by previous falls when he was either drunk or blacking out. Halligen was increasingly shambolic and these blood stains hadn't been cleared up. His house was full of empty drink bottles. A lot of people wished him ill. But he was also unique…his death is almost certainly related to alcoholism. I knew chapter and verse about his life and career ". Gatton made a thoroughly misleading film for Channel 5 about Halligen and Exton. Can we trust his words? - we doubt it. So far we have not heard from Halligen’s girlfriend, nor from members of his family. We have only heard so far from people in his corrupt, security-service-related coterie. And without a post-mortem, members of this coterie are being allowed by the media to state, unchallenged, basically something like this this: “He was so drunk most of the time that he kept falling over, drunk, losing blood every time, which he and his girlfriend never bothered to clean up. Probably this was another time when he drunk so much that he fell and lost so much blood that he died”. Well, MMRG isn’t buying this. Not yet, anyway. Finally, it is of interest to note than no sooner had the Daily Mail run with its story about Kevin Halligen’s death, the first news agency to follow up the story was the SKY News, who quoted Martin Brunt’s report. "Later, Brunt was first to break news of the death of the Queen Mother in 2002 and the murder of television presenter Jill Dando in 1999. In 2005, he was first to report that the 7 July explosions in London were the work of terrorists. Brunt reported from South Africa on the murder inquiry into "Adam", an unknown boy whose torso was found in the River Thames in 2001. "High praise for the Sky News crime correspondent Martin Brunt. When a hack from (another) newspaper phoned Suffolk Police press office with a query on the serial killer case, he was told: 'Call Martin Brunt. He knows everything before we do.' A little concerning." Brunt was first to report the arrest of Amy Winehouse, and the resignation of Sir Ian Blair as Metropolitan Police commissioner, and was the first to interview Robert Murat, then suspected of involvement in the disappearance of Madeleine McCann. His contacts also led to Sky News being first to report that the 7 July events in London were the work of terrorists and allowed Sky News to break the news of the death of the Queen Mother. In 2010, Brunt reported live from Rothbury during the police hunt for gunman Raoul Moat. In October 2014, Brunt was the journalist involved in revealing the identity of Brenda Leyland, who had posted comments concerning the McCann investigation on social media. Following the revelation and a report to Leicestershire Police, Brunt and a camera crew confronted Leyland at her home. Following the confrontation Leyland was later found dead in a hotel, leading to calls on social media for Brunt to be sacked. Brunt briefly became an internet sensation in August 2016, for a Sky news report at St James Church in Weybridge, following the murder of a French priest, Jacques Hamel, by an ISIS terrorist. Brunt was widely mocked for walking out of the church saying "If I was a terrorist, I could’ve killed them all". 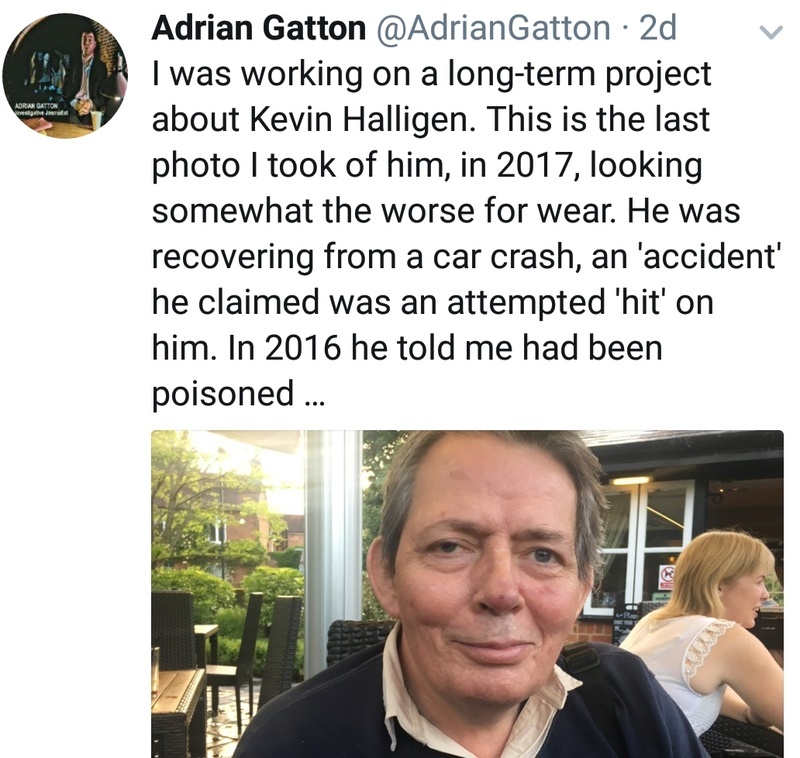 This led to multiple news reports and social media comments ridiculing the reporter "
(1) When was Kevin Halligen's death reported to the Coroner? (3) Has a port-mortem taken place and if so, has the cause of death been established? MMRG have now been told that a press release on these issues is being prepared by the Coroner and will be available tomorrow. 5 Several friends of Mr Halligen have been speaking to the media and have given the impression that he fell down drunk, suffered serious injuries, and died. Two other reports from these friends added the detail that there was blood 'all over the house' which had never been cleaned up because he fell and lost blood on so many previous occasions. 1 When was the Coroner first informed of his death? 2 When was the post mortem held? 3 Did the post mortem establish the cause of death or are further enquiries needed? 4 Has the Coroner opened an inquest into his death (if so when was that) or, if not, is there a date set yet for when any inquest will be opened? We left messages this morning on both 01483 637300 and 01483 637628 (Sarah Church) but got no replies. We 'phoned this afternoon and a very helpful gentleman colleague 'phoned me back stating (I think) that a press release had been or was being prepared and that we should ring Sarah Church, your P.A., in the morning. We were also given your e-mail address and if it is possible for you to let us have a copy of the press release as soon as it is issued, we should be most grateful. As your staff were unable to locate any reported death in Surrey this month for the name 'Halligen' or 'Halligan' we did wonder whether there might be difficulties concerning his name, as we are aware from extensive published research of ours that he has used many aliases. There may well have been several others. We have today been advised that the Coroner’s Officer, Dawn Worsnip, is the person who will be in a position to answer these questions. She was unavailable to talk to this morning but we have left a message asking for a call-back. Your email has been received by the Surrey Coroners Office and will be dealt with accordingly. As in Dr David Kelly - a man who, despite already being dead, managed to move from a prostrate position to go and sit leaning against a tree? I am sure he made a lot of enemies in his life, but reading between the lines it sounds like alcoholic hemorrhage to me . . . but that is obviously what they want you to think. As for martin brunt, there is a man who is obviously the mouthpiece of Security Services. He doesn't do a days work uncovering stories, just re-ports what his masters tell him to. He always has the breaking "news" right from his home office . . . or should that be Home Office. It's a mystery that the Coroner's staff couldn't find any record of Kevin Halligen's death being reported. No press release by the Coroner's PA, Sarah Church, yet either that I've seen. Probably a perfectly good reason for both though. 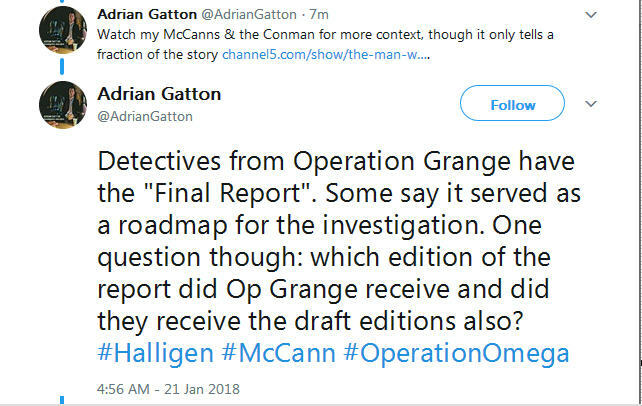 It would appear to me that the TV director and investigative journalist Adrian Gatton (the bloke who produced The Conman documentary) was instrumental in the reportage of Halligen's death hitting the headlines linking directly to the McCanns. Whether or not he was aided and abetted by someone like Clarence Mitchell remains to be seen. I seriously doubt Halligen's death would have been reported by main stream media if it wasn't for the McCann connection. Had a quick run through Surrey Police news but can't find any reference to Halligen, his girlfriend or the Surrey mansion where he is said to have died. It's a toss-up whether the mansion belonged to Halligen or his girlfriend - media reports differ. Halligen's company Red Defence International was registered to an address on Cobbett Hill Road, as reported in the articles as to where he was when an ambulance was called. It could very well be described as a mansion and apparently was turned into 4 flats at some point, so he may have lived in one whilst other people occupied the remaining flats. It seems to me that Red Defence and Oakley International were companies in name only - Halligen, a one man band who sub-contracted as and when required. The reported location of Halligen's death was Henley Park, Cobbett Hill Road, Normandy, Surrey - whether that's his property or his girlfriend's is yet to be determined. Henley Park is clearly property of opulent proportions judging by the entrance and driveway.. There is also an aerial view here..
Goncalo Amaral: "Then there's the window we found Kate's finger prints. She said she had never touched that window and the cleaning lady assured that she had cleaned it on the previous day....it doesn't add up"
Third time lucky then it would seem. Although, still not seen the press release from Surrey Coroner's office after they could find no record of his death. We had one particularly bad experience with a man named Kevin Halligen (or Richard, as we knew him). Halligen was the CEO of a private-investigation firm called Oakley International which was hired by Madeleine’s Fund for six months from the end of March 2008. Oakley’s proposal and overall strategy were streets ahead of all the others we’d considered and the company came highly recommended. As the sums of money involved were pretty hefty, we agreed that our contract with them would be split into three phases with a break clause at the end of each phase. This gave us an opportunity to terminate the contract at any of these points if we wished to do so without incurring financial penalties. An independent consultant was also employed by the fund to liaise with Oakley and oversee the work they were doing. The first and second phases of the contract ran fairly smoothly. Oakley had put in place systems to gather, collate, prioritize and follow up the information coming in as a result of appeals Gerry and I made around the first anniversary of Madeleine’s abduction. There is little doubt that at that stage progress was being made. During the third phase, however, we began to have concerns. Feedback appeared to be less forthcoming and contact with certain members of the Oakley team dropped off. At first we couldn’t be sure whether this was a manifestation of the inevitable waning motivation I’ve mentioned or of a more troubling problem. Rumours about Halligen prompted us to make inquiries before we decided whether or not we should extend our contract with Oakley. To cut a long story short, we chose not to do so. The termination of the contract, in September 2008, was quite acrimonious, and unfortunately, that was not the end of it. Several months later, one of the investigators subcontracted by Oakley contacted us to demand payment for his services. We had already settled Oakley’s bill for this work months before, but apparently the company had not paid him. He was not the only one. Over time several more unpaid subcontractors came to light. We were upset that, although a lot of hard work had been done on Madeleine’s behalf, it seemed money provided by her fund might not ever have reached the people who had earned it. In November 2009 we heard that Halligen had been arrested on suspicion of fraud after a discrepancy in a hotel bill. He is currently on remand in Belmarsh prison, fighting extradition to the USA in connection with money-laundering and wire-fraud charges, all of which he denies. THE extraordinary tactics of the bogus private investigator hired by the parents of Madeleine McCann to find their daughter can now be revealed. Kevin Halligen dreamt up bizarre undercover methods in his bid to catch the little girl’s kidnapper. The Walter Mitty character, who was found dead earlier this month, was a heavy drinker, a liar and fantasist who persuaded Kate and Gerry McCann to part with £300,000 from the Madeleine Fund after visiting them at their home in Rothley, Leicestershire. 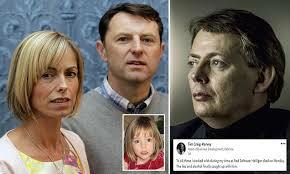 Part of the reason the McCanns were persuaded by him was because he took along Henry Exton, who had run brilliant surveillance operations at M15 and has an impeccable reputation. But Mr Exton was also duped by Halligen. Madeleine vanished on May 3, 2007, and Halligen offered the desperate couple the services of his firm, Oakley International, a year later. The deal was for the so-called Operation Omega where Mr Exton ran an undercover team in Praia da Luz on the Algarve. It was where the McCanns’ friend Jane Tanner had seen a man carrying a child from the couple’s apartment. Halligen went on to recruit a couple with a young daughter to walk around Luz to try to flush out the kidnapper. Richard Parton, a security expert in Washington, was appalled by the ploy. Speaking in a documentary, The Conman And The McCanns, he said: “He got a couple to go on holiday with a child who looks a lot like Madeleine. An appeal for witnesses produced a London City worker who confirmed a description from Jane Tanner. He helped produce an image of the suspect. But one man was trailed for weeks, despite the witness saying he didn’t look like the suspect. Halligen was also supposed to be using top Washington security contacts to secure military satellite images showing who had entered the apartment. No such images exist and Halligen produced Google Earth photographs. An unimpressed Mr Exton was by now £100,000 out of pocket, with Halligen’s cheques bouncing. In 2012 Halligen was extradited from Britain to America where he admitted conning millions of pounds from a company whose executives had been kidnapped in Africa and was jailed. Mr Exton says he regrets working with Halligen but defends the work done in Portugal. “The distraction of Halligen’s behaviour undermined the very good work that was done,” he said. One key part of that work was getting e-fit images of a man seen carrying Madeleine towards the beach, pictures Scotland Yard later publicised. Maker of the documentary, Adrian Gatton, said he saw Halligen in 2017, “somewhat the worse for wear”. He wrote on Twitter: “He was recovering from a car crash, an accident he claimed was an attempted ‘hit’. Surrey Police are preparing a report for the coroner on Dublin-born Halligen’s death on January 8 at the home of his girlfriend near Guildford. They say his death is “unexplained”. What an extraordinary report for a longstanding seasoned journalist. The usual base information repeated ad-infinitum, individualistically embellished and transformed into pro-McCann propaganda. This James Murray character is on a par with Tracey Kandohla and her ilk, never misses an opportunity to churn out yet another nonsense story to boost the McCann image in the public eye. Of all the misdemeanors Halligen had under his belt, why on earth are the McCanns getting all the attention? Unless it can be proven at some stage in the future, which I seriously doubt, that Halligen's demise was directly connected to the McCanns, this is just another non-event. As far as I'm aware, there is still no official confirmation of his death. After the initial report during the week, nothing further has been reported on the subject. Halligen's death has not been reported on the Surrey police website, nor the Surrey coroner for recent and pending hearings. From the above article, "One key part of the work was getting efit images of a man seen carrying Madeleine towards the beach." Carrying Madeleine, really? Thank you for your email. It has been forwarded to the appropriate officer and they will respond in due course. No reply has been received yet, and further voice mail messages left have not so far been returned. We write to renew our questions about the reported of death of Kevin Richard Halligen at an address in Surrey, which the public have been told occurred on 8 January. To recap, when we first contacted your office on Monday 15 January we were told by one of your male colleagues that his death had NOT been reported to the Coroner, either under the name ‘Halligen’ or ‘Halligan’, both of which surnames had been used by him. We were later told that the matter of Halligen’s death had been widely ‘discussed in the office’ and that a press release had either been prepared or was being prepared by the Coroner’s Media Officer, Sarah Church. We were told to call again, and later to send an e-mail, both of which we did, but to this day no-one has either sent us the press release nor told us whether there ever was one. We last sent an email to yourselves on 16 January (see below) but to date we have had no further reply. There have been further reports in the mainstream press about Mr Halligen’s death this week. The claim by the Sunday Express that Halligen was ‘found dead’ specifically contradicts the only report available so far from Surrey Police, which said specifically said that he ‘was taken ill’ and ‘subsequently died’. Moreover, all the press reports said that when he was ‘taken ill’, the police, rather than the Ambulance Service, were called. As you will recall from my previous enquiries, press reports described Kevin Halligen as having been found ‘blood-soaked'. One report said he had been ‘brutally murdered’, while two friends of his have said there were trails of dried blood all over the property, which they ascribed to him having fallen over so many times - and that neither he nor anyone else had cleaned up all the blood. This report of Mr Gatton’s comments suggests that Halligen did not die from any foul play but died from alcohol poisoning or an alcohol-related condition. In that case, it is hard to understand why, if there has been a post-mortem that has decided he died from alcoholism, Surrey Police continue to describe Halligen’s death as 'unexplained'. 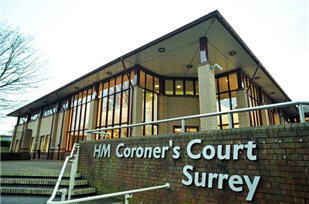 The fact that Surrey Police state that they are ‘preparing a report for the Coroner’ suggests that you must already have been informed about the death. It seems reasonable, therefore, to enquire whether there has been a post-mortem, and when (if at all) you were informed of the death and, if so, what action, if any, you have subsequently taken. 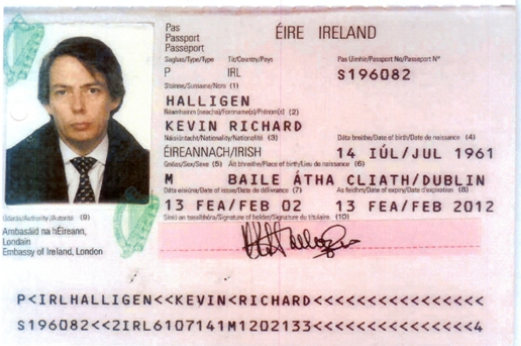 It may be that for some reason you are unable to supply us with any information at all about Kevin Halligen’s death. If that is the case, could you be good enough please to supply a short reply confirming that. We should be grateful. An inquest will be opened on 24th January at 10am, and you are welcome to attend. Note: This is just the formal opening of the Inquest. This is a formality and normally only takes a few minutes. It would appear that the police are still making enquiries. We would expect the full inquest to take place many weeks or even months from now. A post mortem must have been held and there may be some kind of report on that made at the formal opening of the inquest. The Coroner has the right to request a second post mortem or other expert medical opinion and again there may be an announcement about this on 24 January (tomorrow). So Brunty's been talking to Halligen (shortly?) before he died? Sorry, misread the tweet. This is Adrian Gatton talking, not Martin Brunt, who's just been copied in. Inquest adjourned until 2nd July 2018. Why does a 'straightforward' case take so long?